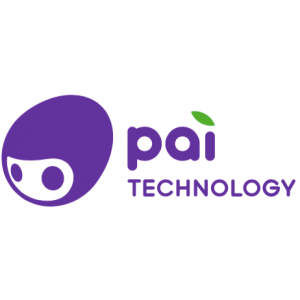 Pai Technology is on a mission to create products for modern families to help kids play, grow and learn with technology. They have a number of different and really interesting products including Ocean Pets and Cube-Tastic! Pai Technology kindly sent us these AR enhanced toys to try at home. In this post, we will look at the Ocean Pets activity set and will tell you more about Cube-Tastic in another post. Disclaimer: Pai Technology provided us with products to review. This is not a sponsored post and our views are always our own. I got a hands-on demo of Ocean Pets at the recent Bett Show and loved the idea immediately. Ocean Pets is a craft activity injected with AR technology for digitally minded kids. 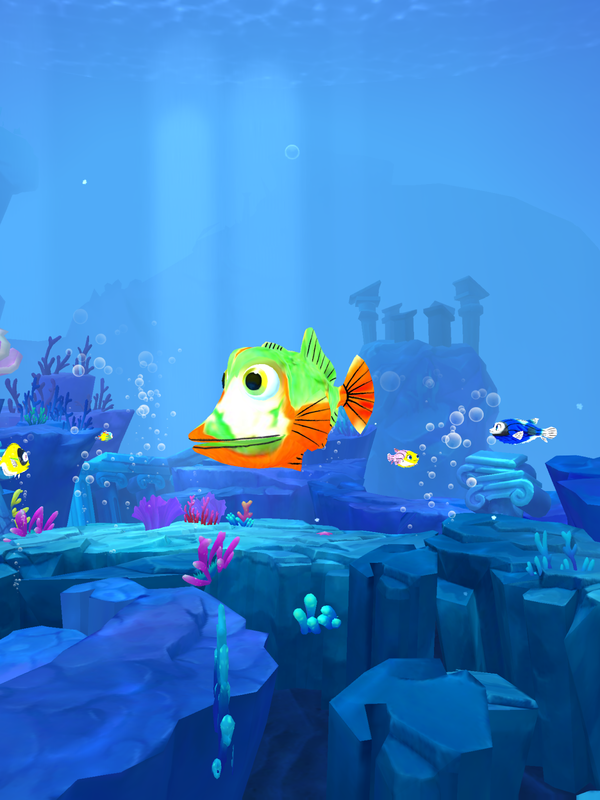 What you end up with is a virtual aquarium with your own homemade fish swimming around in it. 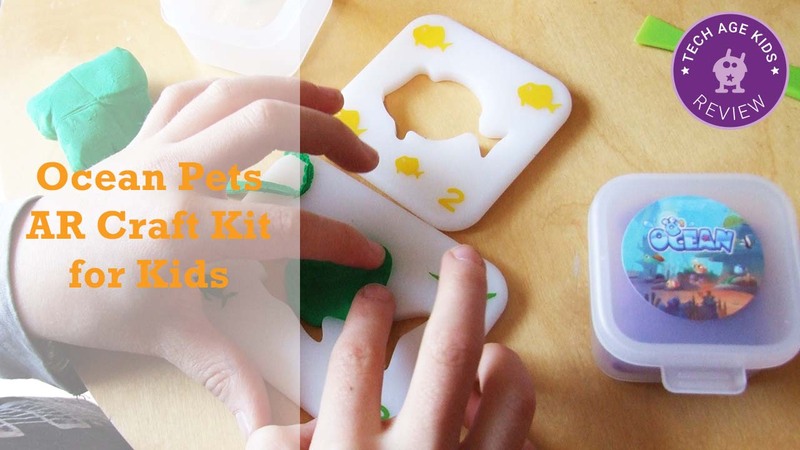 So let’s find out how we got on with the Ocean Pets kit with our kids ages 6 – 10. 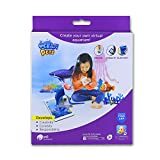 Pai Technology Ocean Pets – Create Your Own Virtual Aquarium Combining Mess-Free Putty and Magical Augmented Reality. Free iOS and Android App! Ocean Pets comes in a nicely designed compact box – a perfect size for a great birthday or special occasion gift. 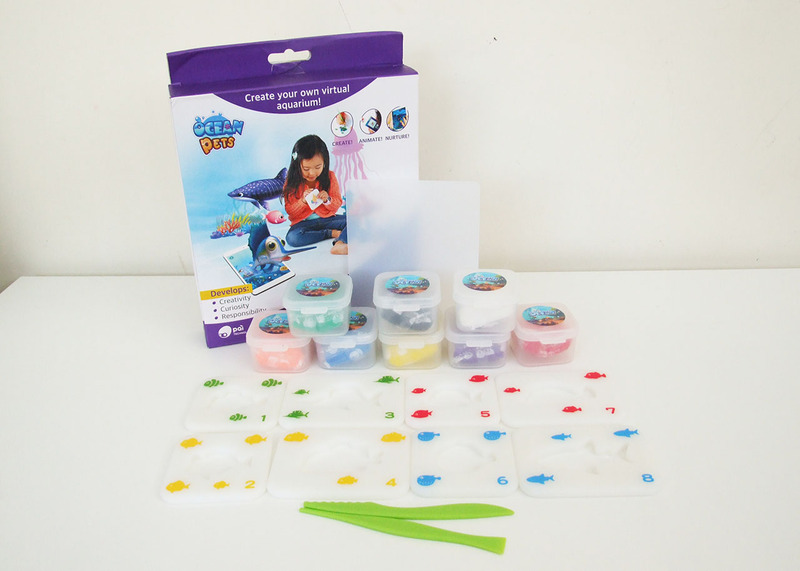 The kit comes with 8 silicon fish-shaped moulds, a couple of crafting tools and lots of little, plastic, reusable pots of brightly coloured air drying clay – eight to be exact. 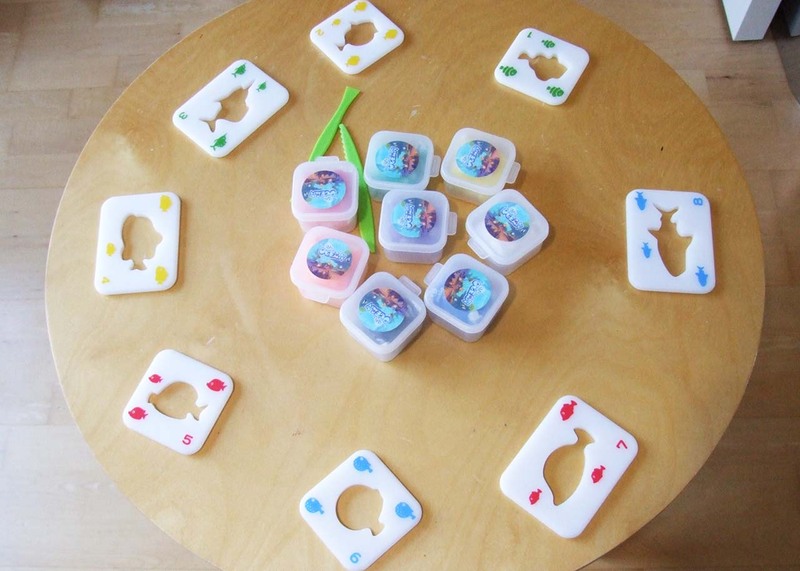 There are 4 small fish-shaped moulds and 4 larger silicon moulds. They are all numbered 1 – 8. This is important for when you get to scanning your fish into the app! The air drying clay comes sealed to prevent drying out. Once opened and in use, the lovely plastic pots close nice and tight to keep the clay from drying out. When you run out of the clay provided in the kit, you can top-up the pots with more air drying clay. 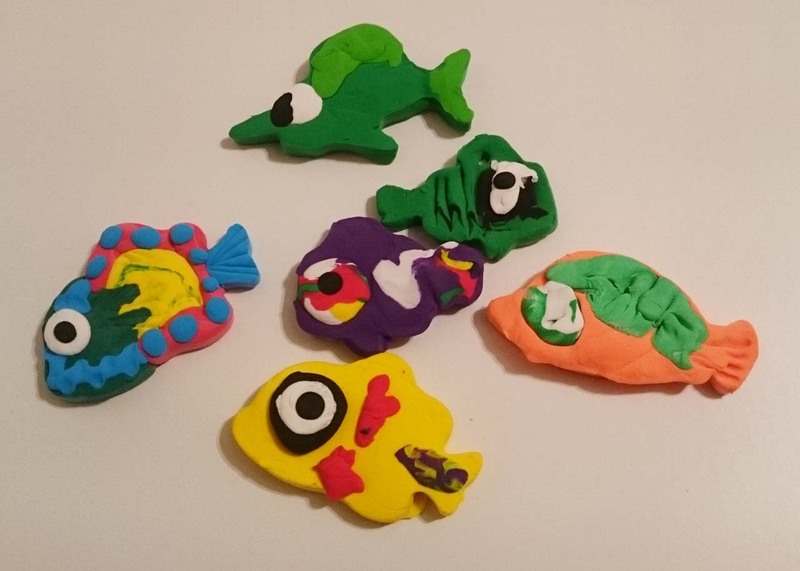 Our kids were able to make fish with all 8 moulds twice over with the clay provided in the kit. I love the fact that you can mix technology and craft with this kit. Tracy and I set up an Ocean Pets crafting table for our boys to make their fish using the air drying clay. At ages 6 – 10, they all enjoyed the activity. It is a perfect activity for younger kids. Ocean Pets is recommended for ages 3+. 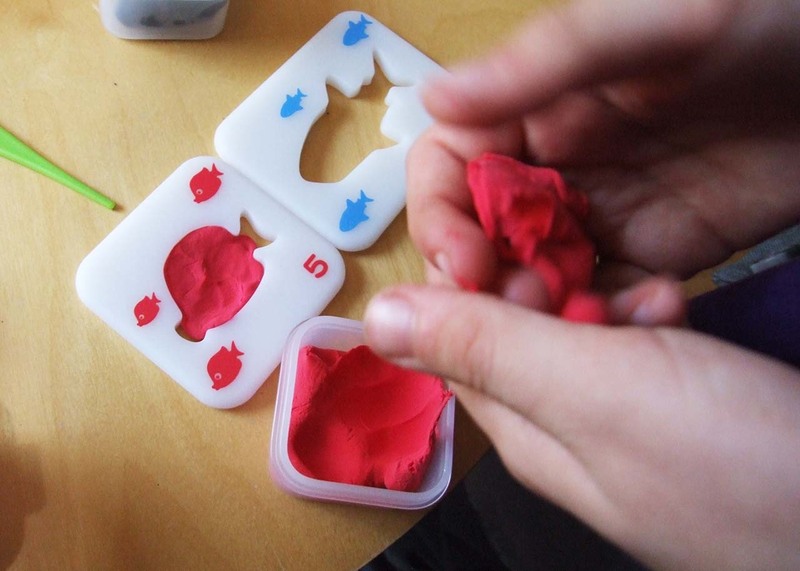 Air drying clay is a fantastic medium for kids to craft with. It makes little mess and is easy to mould. The kids really enjoyed blending colours to make new colours and marbled effects. 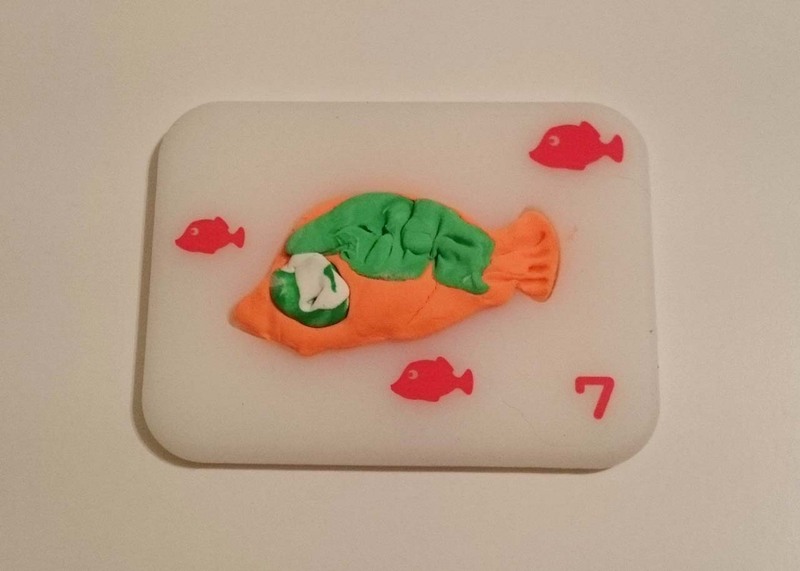 The idea is that you use the mould to make your own fish. You can either try to make the fish as it is in real life, or make your own creation. The app has a tutorial on how to make each fish if you wish to make more “real” looking fish. Once you’ve completed the fish you need to scan it into the app. Go to the app, select the number that matches your mould and scan your fish. We found holding the device at an angle works really well. The kids managed to scan all their fish without any adult support. Let the fish dry in the mould and then you can pop it out and you have a real life pet fish to play with or make an ocean mobile or hang on your backpack. The Ocean Pets app is free to download for iOS and Andriod devices (it’s not available on Amazon Appstore yet). We had no trouble finding and downloading it from the AppStore. Parents may appreciate the fact that no sign up is required to use this app. Just open, scan your fish and you’re ready to play. We were quite impressed with the accuracy of representation of the crafted fish in the virtual aquarium. The kids were delighted to see their own fish come to life in the water. In the app, kids can learn a few facts about the types of fish in the aquarium. They can also take photos or record 10-second videos of their fish swimming in the aquarium. There’s also voice recording capabilities built into the app. Once they are happy with their aquarium, kids can use it as a picture frame or take a selfie with them in the fish tank! We did notice there were more ocean creatures in the app, which we didn’t have moulds for. It’s unclear whether there is an add-on pack to get these moulds, but it says coming soon. We’ll update the post with details soon. The Ocean Pets app introduces young kids to the ideas of augmented reality (AR). Unlike virtual reality which replaces the real world with a simulated world, AR aims to enhance your perception of reality. Ocean Pets makes it possible for kids to independently scan in a real-world object into a virtual world. Inside the app they can either watch the fish swim in the aquarium or put on some virtual goggles and swim with the fish. They can overlay this virtual world onto the space they are physically in, to experience the fish swimming around the house. 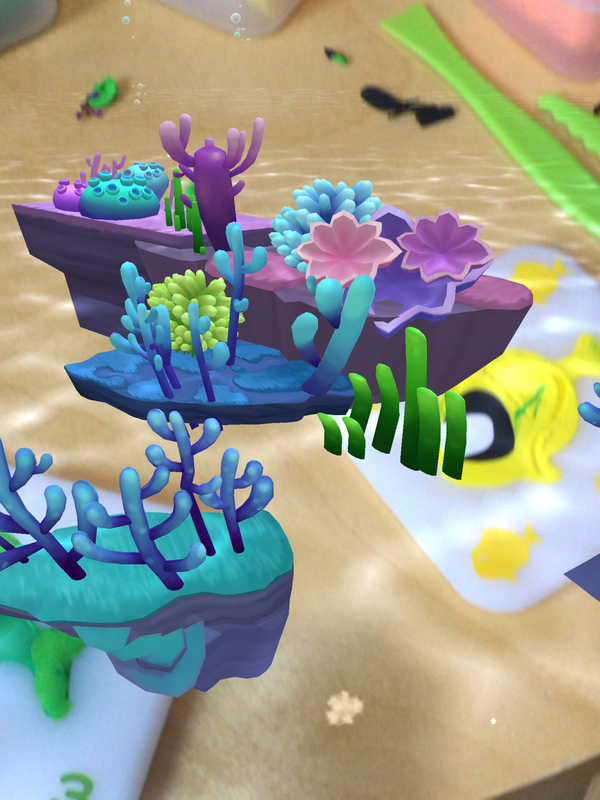 We really liked Ocean Pets, especially the idea of combining physical and virtual world activities. With this activity set, kids can have plenty of making fun and enjoy playing on a mobile device. I reckon most parents would be happy for their kids to spend time doing a digital activity like Ocean Pets. The app is well thought through with lots of things to do and explore including some gameplay. Kids also need to nurture and care for their fish by feeding them. They do look a little sad when they have not been fed!